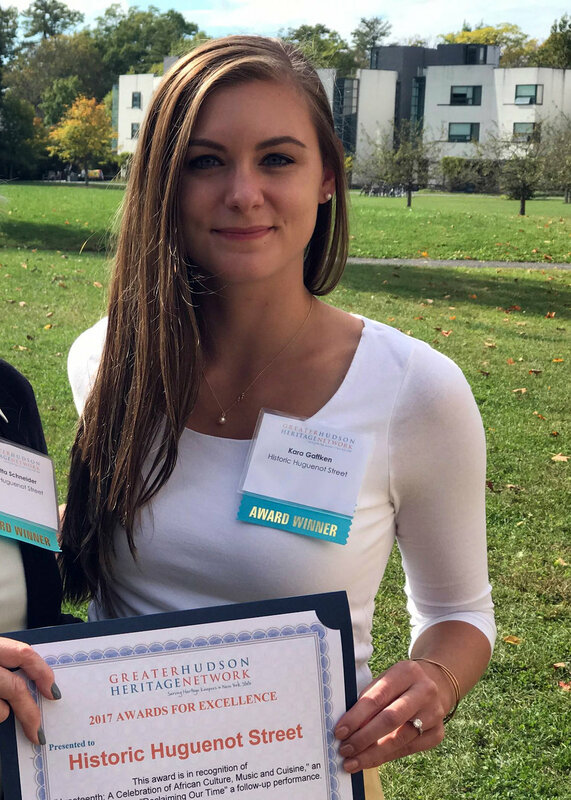 Director of Public Programming Kara Augustine in 2017 with Historic Huguenot Street’s Greater Hudson Heritage Network Award for Excellence. NEW PALTZ, NY (March 26, 2019) – Historic Huguenot Street is pleased to announce its Director of Public Programming, Kara Augustine, has been recognized by the Museum Association of New York with a 2019 award of merit for her outstanding work and innovative programs. Augustine was awarded the Rising Star for Education/Public Programs for enriching New York State museums with new and remarkable projects. “I’m honored to be recognized by an organization that awards individuals and institutions whose work and scholarship are of the highest merit,” Augustine says. The Awards of Merit were judged for programs conducted in 2018 and will be presented as part of the Museum Association of New York’s 2019 conference “Access and Identity” at the Otesaga Resort Hotel in Cooperstown, on Monday, April 8, 2019 at 8 AM. You can learn more about the conference on the organization’s website.